This hamster-powered walking robot was created by hobbyist and roboticist crabfu. The video below shows this walking robot, which was hacked from a Gakken mini strandbeest walker. ... hamster powered? that's just stupid, which is the exact reason why I did it. It's different, hasn't been done before, yet it's in so many what's-under-the-hood jokes. It also had a high likelyhood of working, so I had to attempt it. Only problem: I don't have a hamster, I don't want a hamster for a pet, and I don't know what sort of power and weight a little critter like that has. All I know is that I've seen them go ballistic on the hamster wheel, and so they must have great weight to power ratio. SF readers may recall the Martian perambulators used in Robert Heinlein's 1951 novel Between Planets to help Martians get around on Earth. 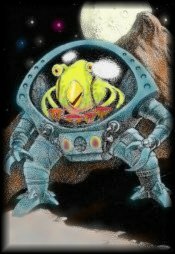 Gamers may recall the Orz from Star Control 2; this race of aliens used an anthropomorphic exoskeleton to get around in when on land (thanks, Yossi).